Astronomy What’s up with Dark Matter? In reality, there is a strong pool of evidence that supports the existence of dark matter even though scientists aren’t sure exactly what is going on. The existence of dark matter explains many unconnected phenomena in physics, the theories developed to explain this are then confirmed or disproved through observation and experiments – the scientific method in action. Dark matter, just like everything else, is a relic of the big bang. As the universe cooled dark matter would have emerged from the energy soup, just as protons and electrons did. There’s nothing that makes it any more special than the current known particles except its invisible to the way we normally detect matter. You can ‘see’ its existence by following its gravitational footprint, this is how astrophysicists first hypothesised its existence in 1932. Part of the problem comes from the name, due to unimaginative scientific naming (a problem in physics), it often gets confused with dark energy. Physicists know much more about dark matter than dark energy and their confidence in its existence is much higher (but that’s for another day). The reason why dark matter is dark is because it doesn’t interact electromagnetically. It’s a material that interacts gravitationally bending space as normal matter would. But as it doesn’t interact with electromagnetic fields, that is when observed in different wavelengths of light (part of the electromagnetic spectrum), nothing is observed, hence the term dark. As it doesn’t interact electronically, dark matter theoretically could pass through you or any other physical matter. Now there are other particles, such as neutrinos that can pass through matter, making them difficult to detect, but neutrinos interact through the weak nuclear force so they can actually be measured. But wait, doesn’t dark matter interact gravitationally? Yes it does, but the gravitational force on small scales is so weak, that it becomes almost impossible to detect. It is through its gravitational interactions that we can even observe that something is there. Many observations including the CMB strongly suggests the existence of dark matter. It helps to explain why the calculated mass of a galaxy is around 10 times more than the mass of all its stars (planetary/lunar/asteroidal mass is negligible on this scale). We know that galaxies are rotating, quite fast actually, so much so that all the stars and planets should come flying out, expanding the galaxy, but the extra mass from dark matter results in the extra gravitational force required to hold the galaxy together. Observation of galactic rotation suggests dark matter is spread throughout the galaxy. There are a few theories as to what dark matter is and we know a lot about what properties it has. We know that it doesn’t interact through electromagnetic or strong force, so it is unable to form complex atoms, composed of protons, neutrons and electrons. Also that is relatively stable (as it doesn’t interact), so they wont decay to lighter particles. The point is, we know enough about dark matter that if a model of physics beyond the standard model was given, physicists would know exactly where dark matter would sit in it and what particle would be the likely dark matter candidate. Two of the most prevalent hypothesis for dark matter is that it is like usual matter, except very hard to detect, the MACHO model, Massive Compact Halo Objects, things like black holes that don’t emit or absorb light. The second is WIMP (more intentionally unfortunate scientific naming), Weakly Interacting Massive Particles, these are kinds of particles (or matter) which don’t interact with electromagnetic fields (by definition), like neutrinos, but bigger. They are the strongest candidates for dark matter. WIMP is the premise behind many of the current experiments to detect dark matter such as CDMS (II), XENON100, and DAMA/LiBRA, etc. They are finding out if the matter is able to interact through the weak force, meaning they can collide and scatter. These experiments are shielded deep underground and based on detecting neutrino interaction. 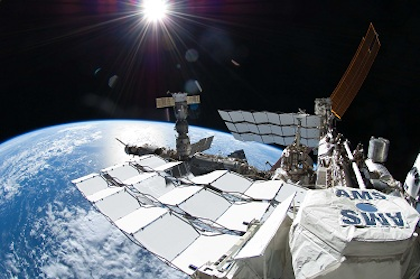 Other experiments in pursuit of dark matter include the Alpha Magnetic Spectrometer AMS experiments on board the International Space Station. Its observations are based on WIMP theory and determining their source from the energies of the particles. Other explanations for the observation is that physicists have misunderstood gravity. Albeit a minority view, it is the basis of MOND, Modified Newtonian Dynamics. MOND does away with dark matter altogether, but it hasn’t been very promising. Dark matter still explains observations far better than reworking gravity. Like many other of the experiments being conducted, learning the truth about dark matter will drive scientific theories about the fundamental structure of matter and the universe, pointing a way for physics beyond the standard model. But there is a reason it was coined as ‘dark’ – being hard to ‘see’. Dark matter remains as elusive as ever.